What if living globally was more than just about the foods you eat? Well, okay, we all know that it does mean much more. Living globally extends beyond the food you seek to wake up your palate and nourish your body. It’s a lifestyle, a mindset. It’s travel. It’s bringing the world home—through culture, relationships, music, traditions, style, and a lot more, besides food. It’s a fine art of living. I think about this often. I used to travel A LOT, primarily for work. Now that I’m a stay-at-home mom and not traveling to exotic locales around the world as much as before, I look for creative, interesting and tasty ways to introduce my son to the many facets of the world around him. Several weeks ago I looked through my cupboards and had the urge to cook something new. I wanted different, exotic and full of flavor. Ethiopian came to mind, but none of my cookbooks from my ever increasing collection had anything covering Ethiopian cuisine. The following day, on a whim, I entered a local Ethiopian market and deli (Merkato) and asked if they would be willing to teach me how to cook Ethiopian food. The kind and friendly gentleman who greeted me was a little surprised and confused and asked, “Uhm, you want us to teach you to cook Ethiopian food? O-kaaay. When, now?” I couldn’t stay then so I asked if I could come the following week. He agreed. As I walked away, I thought of how bizarre that must have sounded to him. Then I thought of an Ethiopian neighbor I have and perhaps I should have asked her instead. She and I had only greeted each other from time to time in the hallway, exchanging pleasantries, asking each other how are kids were doing, but that’s about it. The following week, I went back to the deli. As I entered, I was surprised at who I saw behind the counter—my lovely Ethiopian neighbor!!! Needless to say, we both had a good laugh and have since become friends and have exchanged many recipes from our kitchens! She graciously offered to come over to my place to teach me how to cook delicious Ethiopian food. Yes, I’m lucky, I know! 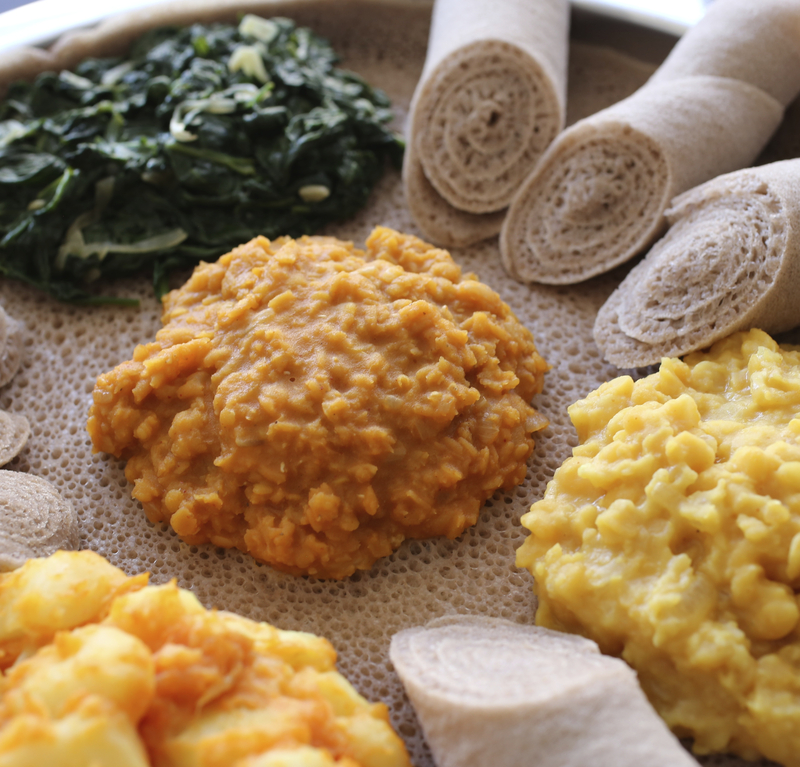 Ethiopian dishes typically consist of injera, a spongy sourdough flatbread made of fermented teff flour, spread flat over a communal pan (a large platter) and topped with several kinds of spicy and non spicy wats (stews) and vegetables. As I’m vegetarian, my neighbor suggested we make yetsom beyaynetu, the vegetarian combination platter. It’s made up of a mix of vegan curries and vegetables served on a plate of injera. Yetsom means fasting and beyaynetu means combination platter. In principle, the combination platter is very similar in composition, but not flavor, to an Indian thali. Ethiopians are predominantly Orthodox Christians so many follow the fasting days prescribed by the Church. There are many fasting days—every Wednesday and Friday, and during Lent. In Ethiopia, fasting doesn’t mean refraining from all food. Instead, one is to eliminate all animal products (meat, dairy, eggs, etc.) from the diet. Basically, they adhere to a vegan diet during fasting days. As a result, Ethiopian cuisine contains many dishes that are vegan. Awesome! When my neighbor came over to teach me, we made four toppings (see first photograph above). A few days later, I decided to be adventurous and made six toppings (photo below). 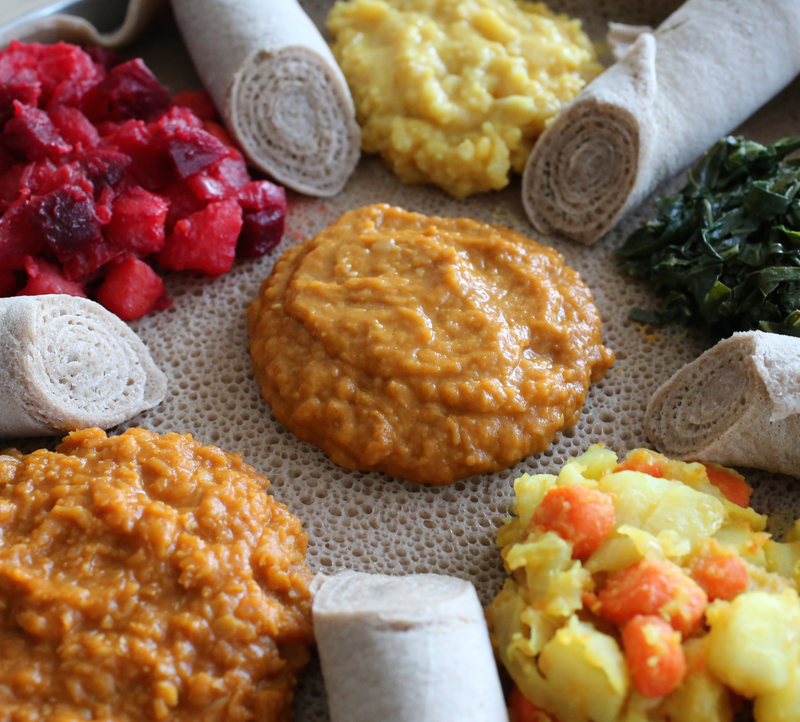 In a typical Ethiopian vegetable platter, you’re likely to find shiro in the center (as in the photo below). 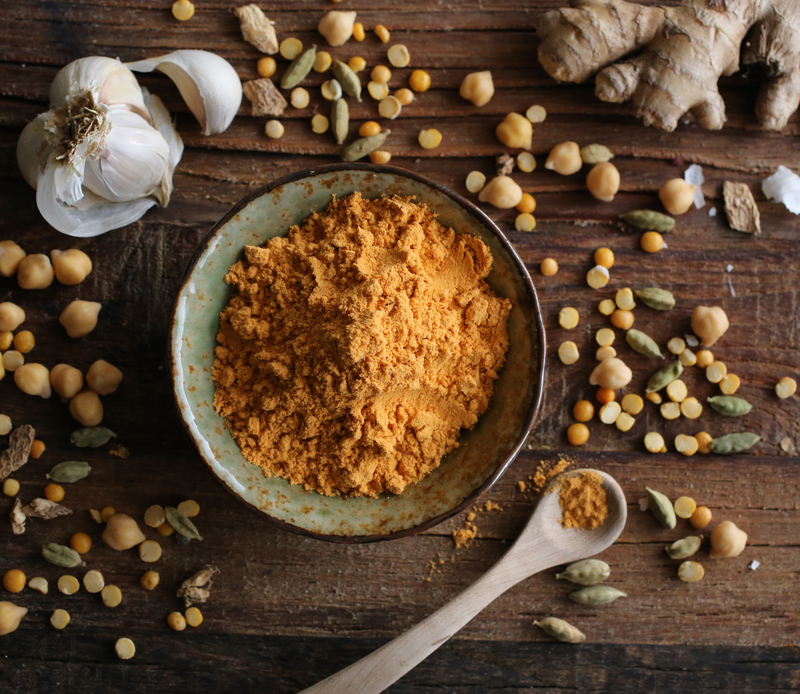 It’s a delicious chickpea powder-based dish that is slow-cooked with onions, garlic and Ethiopia’s popular spice blend, berbere. There are several kinds of shiro to enjoy—from the soupy thin to the very thick, but they’re all good. Mine is a little on the thicker side. Also, sometimes shiro includes lentils and broad beans. 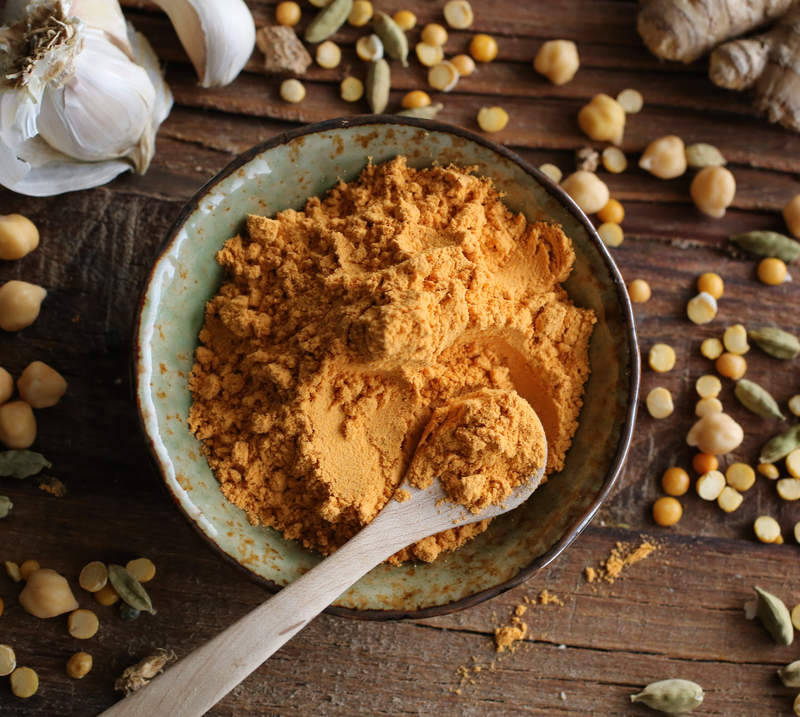 From my local Ethiopian market I was able to by a bag of shiro powder that included extra seasonings and ingredients like berbere, yellow split peas, cardamom, garlic, and ginger. Shiro powder is available at Ethiopian markets or through online sites like Qmem. Other dishes—wats and vegetables—in a vegetarian combination platter vary. Besides shiro, the other toppings I made were miser wat (spiced red lentils), kik alicha (yellow split pea stew), gomen (collard greens), dinich ena karat alicha (potato and carrot stew) and key sire (beets, potatoes and carrot stew). There are many other toppings that can be made of other legumes and vegetables. What I made are just a few options! Another Ethiopian spice blend I wanted to mention is mitmita, the second most popular spice from Ethiopia behind berbere. It’s a very aromatic, red-orange colored, and super spicy Ethiopian spice blend normally used by Ethiopians to season raw beef. So far I’ve used it to sprinkle on other foods to add a little heat and flavor. This is the final post in my mini (three-posts) series on Ethiopian cuisine. I hope you’ve enjoyed it. If you’ve never had Ethiopian cuisine before, I highly recommend finding a restaurant in your area. If you’re not sure what to order, start with Yetsom Beyaynetu. Also, I’m curious, do you live globally? If so, how? What ways do you try to bring the world home and make it part of your lifestyle? 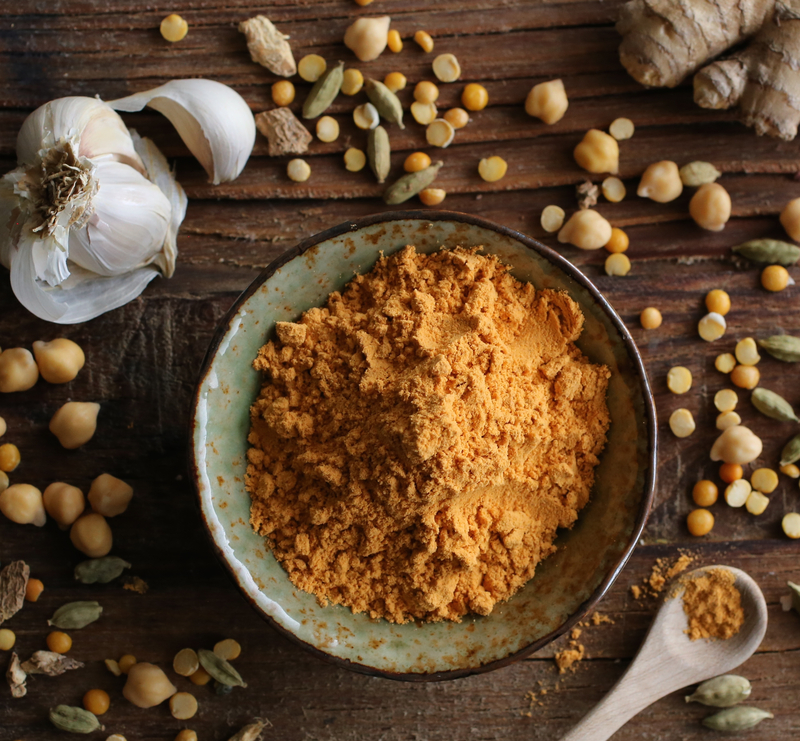 A spicy chickpea powder-based dish seasoned with onions, garlic, and other spices. Saute onions until translucent, add garlic. Add 4 cups water and bring to a boil. Add shiro powder, whisk until dissolved. Cook for 35-45 minutes, adding more boiled water to thin the consistency, if necessary. The consistency should not be sticky of clumpy. 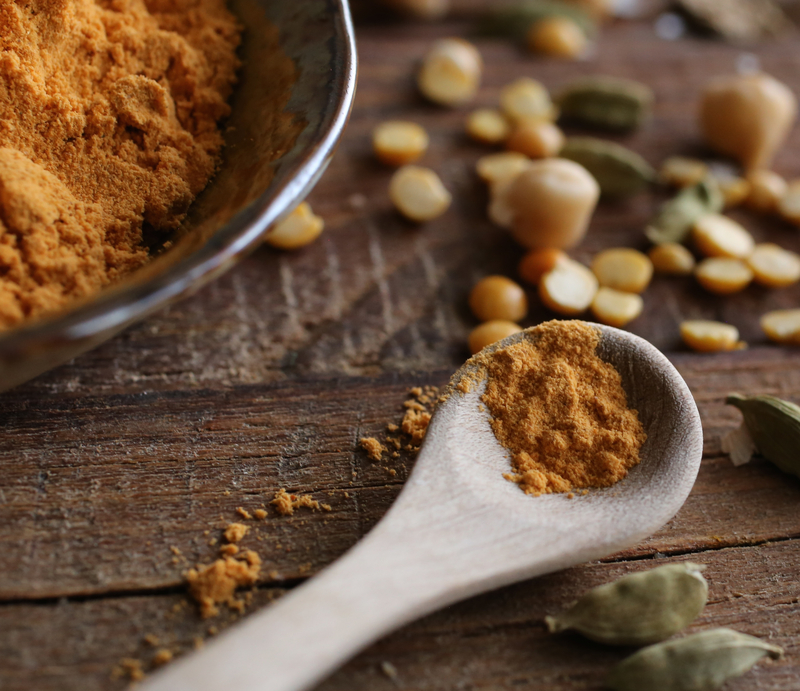 A delicious combination of split red lentils simmered in spicy berbere sauce. Depending on the ingredients, it can sometimes be darker. Heat oil in a sauce pan and sauté onions until translucent. Add berbere and stir until well coated. Add garlic and cook until flavors have melded, about 5 minutes. Add a little water to blend, then add lentils and stir until well coated. Add ½ teaspoon salt and 3 cups of water. Cook until lentils have broken apart, adding more water if necessary. The consistency should be like a thick stew. Taste and adjust for salt. Note: Berbere gives the red lentils the spice and a deep red color. If you can take heat, try a full tablespoon, else start with 2 teaspoons and slowly add more to suit your taste. I only used two teaspoons for a larger audience to eat it, but I would have liked it with more. I like spicy! This split pea stew is often cooked with a light turmeric sauce. There are different kinds of alichas (and ways to spell it in English). It often depends on the exact spices and consistency of the lentils and sauce. Bring about 3 cups water with oil to boil. Add peas. Cook until they are soft and break apart, about 45 minutes. Add more water if necessary. Set aside. In a separate saucepan, sauté onions in oil until translucent. Add garlic and stir until fragrant. Add turmeric and stir well. Add split peas and ½ teaspoon salt and cook an additional 15 minutes, adding more water if necessary. Taste and adjust for salt. Made of collard greens and simply spiced to perfection with garlic, onions and salt. Heat oil in a large pan, sauté onions until translucent. Add garlic and cook until fragrant. Add collard greens and cook until softened, about 30 minutes. Season to taste with salt. A vegetable combination of potatoes and carrots simmered in a light sauce. Sometimes cabbage can also be added. Heat oil in a saucepan, add onions and sauté until fragrant, add garlic and stir until fragrant. Add potatoes and potatoes stir until slightly softened. Add turmeric and stir until well coated. Add a little water and cook until potatoes and carrots are softened (cooked). Season with salt. This simple stew gets a tangy kick from the addition of lemon juice or vinegar. Sometimes the beets can be marinated for a very tangy stew, but here they’re not. Heat oil in a saucepan, add onions and sauté until fragrant, add garlic and stir until fragrant. Add beets, potatoes and carrots, stir until slightly softened. Add vinegar or lemon juice, turmeric and stir until well coated. Add a little water and salt and cook until potatoes and carrots are softened (cooked). Taste and adjust seasoning. Notes: As mentioned above, the six dishes I cooked are just a sampling of Ethiopian vegan/vegetarian dishes. If tomatoes were in season right now, I would have added a nice tomato salad that is often added to this type of combination platter. Many Ethiopians cook with vegetable or canola oil. I choose to use olive oil. I also chose to reduce the amount of oil that’s often used to cook these dishes. Ohh finally I’m so happy you posted these recipes. I have been wanting to try cook myself ever since I had a sample of Ethiopian food at a community gathering! As a multicultural family we have Norwegian pancakes on Thursdays, (crepes like) topped with lots of yummy stuff. And norwegian waffles with brunost (sweet brown cheese) during the weekend, we also uphold most of the Norwegian holidays and cook accordingly. I also cook Romanian staple foods on Romanian holidays and sing Romanian lullabies to my kids. So mostly yes it all comes down to food over here ha! Thanks Bianca! So happy this cuisine is of interest to you!! Let me know if you try any of the recipes! I love hearing about the Norwegian and Russian traditions you’re incorporating in your home. So nice, especially the ones with yummy foods. 😉 Would love to know more about the Norwegian crêpes! Beautiful post, Martine. I was hoping you would present a post to show how to use injera. Absolutely delectable presentation. I have to read the post again and learn about the arrays of spices/ingredients mentioned. Reblogged this on Lavender Loafers. Hi Denise, thank you so much for your comment! I would encourage you to try this type of platter (or even just one of the dishes I included) sometime! It’s wonderful that you’re trying to pay more attention to healthy foods. Bravo! 🙂 It’s always a good thing to try to eat more healthy! All the best! Hi! This recipe looks great, can’t wait to try!! Is it possible to make a lot of the stew components in advance and then simply reheat in microwave/stove top, or is it best eaten fresh? Thanks for the amazing blog post!! Hi Natasha, how long do you plan to store it? Freshly made is great, but you can certainly also make them in advance to be reheated later. You may need to add a bit of water when reheating if the stews get too thick and dry. All the best! Thank you for posting this. As a vegetarian living in Ethiopia I have been tying to figure the local names of this dishes. Usually, I order them in restaurants. Your post is quite useful. You’re welcome. I’m happy my post can be of help. Enjoy Ethiopia! This looks fantastic, I’m excited to try out these recipes. I’ve never made Ethiopian cuisine before, but this looks manageable! Thank you!! Please let me know how it turns out for you!